Ever had a printer act up or run into problems when you were in the middle of printing something important? 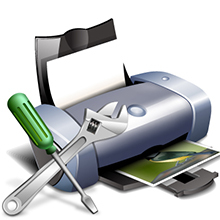 It can be really frustrating if you are not sure how to fix your printer problem and get it printing again. Fortunately, there are some steps you can take to troubleshoot and fix common printer problems across most brands of printers. If you recently installed a new cartridge, check to see if you have removed the sticker from the electronic contact points of the ink cartridge. 8. You have replaced your ink cartridges and the printer still refuses to print. Consider resetting your printer. To learn how to do this, visit Google and search for ” How to reset [MAKE AND MODEL NAME] printer”. This should help you find some helpful guides to do so. If you are having problems using the bundled printing software, a quick reinstall might just fix the issue. Uninstall the software package through the Windows control panel, restart your computer, visit your printer manufacturer’s website, download and install the latest version of the printer software and try it again. The other option is to permanently uninstall the printer software and rely on the default (but basic) printing options available in any application you are using. Still having trouble with your printer? Go ahead and post your question or problem in the comments section below and I’ll try my best to help.